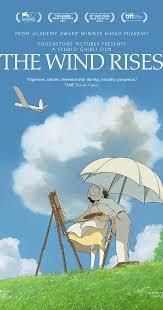 I am a huge Hayao Miyazaki fan, so when I saw this movie on the shelf, I just picked it up and watched it. Now, I liked the movie a lot, but this is not a children’s tale. It is a story of a man, a genius, who loves airplanes and becomes an amazing engineer right before World War 2. We don’t see a lot of the war, we do see some interaction with the Germans, and Japan’s struggles with a recession. There is also a sweet and sad love story. Of course, the animation is outstanding. At one point there is an earthquake, and the visuals took my breath away. It’s an engaging story, full of beauty and art. While I won’t say it has a happy ending, there was a sweetness to it. Not his usual movie, but if you’re a fan of his, or Japan, or airplanes , it’s well worth checking out. Not really for kids. I think they would get bored. My Daughter Making Hardened Criminals Cry Since 2014	Picking a Meal Based on the Sauce.